This year, the Green Schools Conference & Expo (GSCE) will be held in St. Paul, Minnesota on April 8-10. The conference brings together people who lead, operate, build, and teach in U.S. schools. Teachers, parents, students, school and district staff, educational leaders, building industry professionals, non-profit partners and others who are passionate about making green, healthy schools a reality are invited to attend. The conference includes two full days of programming and offers inspiring keynote speakers, informative workshops and breakout sessions and the chance to network with colleagues from across the country. Visit greenschoolsconference.org for more information and explore the full schedule online. Learn about sustainability education for all ages, energy efficiency, social equity, health in schools, and more. Note, early bird registration ends on February 22nd. 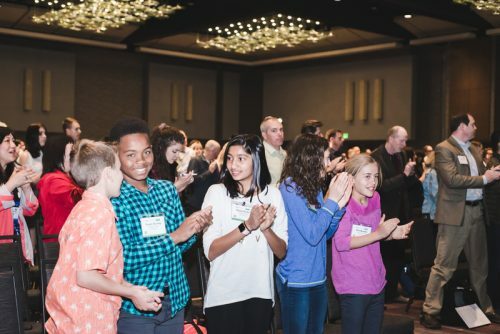 Project Learning Tree (PLT) and the Sustainable Forestry Initiative (SFI) are proud to be Green Schools Conference & Expo (GSCE) 2019 National Partners. The conference also features a Student Summit: Become a River Hero. Designed for grades 7-12, students will learn about Minnesota’s lakes and rivers and create a plan to protect your community’s waterways and the living things that depend on healthy waters. Develop plans with other River Heroes to implement a campaign to protect or restore the health of your local waterways. The cost for the Student Summit is $100, including meals and supplies, and scholarships are available. Register for the Green Schools Conference & Expo today! A variety of registration packages are available. James McGirt is Manager of Project Learning Tree’s GreenSchools program. James started his career as an education specialist for the District of Columbia’s Board of Education, then went into the classroom to teach 3rd-12th grades. Later he was Director of After School programs and Principal for both the middle school and the adult education program at the Friendship Edison Junior Academy in Washington, D.C. Available online and in print, this poster provides ideas to reduce your school’s environmental footprint based on five areas covered by the PLT GreenSchools Investigations.